It may seem obvious that a nation with such a combustible landscape and an integral maritime history have a fire-boat or fire-float fleet to protect waterside facilities and the vessels on the water. The history of fire brigades in NSW, at first following the UK system during the 1830's-40's where insurance companies provided fire fighters and people had to pay to have them attend, did not become a Government overseen and regulated practice until 1884. Although discussed in parliament as early as June 15, 1854 after the Tooth and Co brewery on Broadway burnt for five days, prior to 1884 most fires were fought by convicts and soldiers. Insurance company brigades would only attend fires with their badges affixed to the premises. Australian International Exhibition, Sydney, 1879-1880 at the Garden Palace. Image No. : H24950, courtesy State Library of Victoria. The first to follow this practice in Sydney was the Australian Insurance Company in May 1836. They too issued badges to be nailed to buildings. In 1837 the City of Sydney Building Act established a building code that included the erection of party-walls between terraces to stop fire spreading, set up firecocks’ on water mains throughout the city and added incentives to fire companies to attend; the first engine to arrive and put water onto the flames received 30 shillings, 20 for the second,and 10 for the third. As an added incentive wharfies who joined the firemen were exempt from having to serve at sea as mariners. CHAIN-GANGS of convicts were taken to Goat Island from the hulk Phoenix in 1833 to transform the place into a powder magazine depot. They were accommodated in three wooden huts surrounded by a stockade. By 1838, the sweating convicts had completed the magazine structures, and were then put to building a barracks for the harbour water police. This they completed by 1839. Sandstone for the buildings was quarried on the island. At the time, Goat Island's quarries were considered to be the best in the colony, and many Government buildings subsequently built in and around Sydney in the early days were constructed from the island stone. The 100ft long, six-feet thick walled, arched-roofed magazine, and another sturdy building nearby are used now by the Maritime Services for departmental shipwright work. Workmen travel over daily from the mainland. The old magazine is used now as a storeroom, and the other building as offices for the department's shipwright depot. Both buildings are as good as ever they were, as are the old water police buildings and a residence which was originally the home of the military commander of the island. The old police barracks are used now to house single members of the water fire brigade. The actual police station building is occupied as a residence by Mr. and Mrs. Fleck. I’d love to live in the Fleck's house. It has undergone certain interior alterations, of course, but the solid old walls, with their arched doorways, and the general architecture of the place carry an atmosphere of old time tranquillity. Even though it was once a police station! For the first 40 years of colonisation, Goat Island, originally called "Milmil" by the blacks, was left in its natural state, undisturbed. Then, Governor Bourke, in 1833, took up the strings where his predecessors had left off on the idea of making use of the island for military purposes, and its history commenced. You can still see, bayonet-inscribed on the thick walls of an antiquated sandstone sentry-box on the western side of the island, the initials and crude attempts at carving of garrison troops-men of the Royal Irish Regiment and other Imperial soldiers stationed there in the mid-eighties. The island ceased to have any, military significance in 1868, when it became merely a storing place for minor explosives and ammunition. In 1900 its administration was transferred to the harbour authorities. In the early part of this century it was the location of residence for the Harbourmaster. It became the headquarters for the port fire brigade in 1901, when the equipment consisted of only one fire float, the Pluvius. Sydney Harbour Trust Fire Brigade, Sept 1913. Image No. : d1_48357, courtesy State Library of NSW. The earliest official recorded fire fighting unit for the Northern Beaches originated at Manly as early as 1868. Other sources state the Manly Volunteer [Fire Fighting] Company was formed in June 1877 and occupied premises in Market Square. The Company was registered with the Metropolitan Fire Board in 1886 as Station No.24. The volunteers owned the premises from which the brigade operated in 1895. A new station in Sydney Road opened 25 February 1898. By 1903 Manly had partially-paid staff (1). First permanent staff were appointed in 1912. A new station on the corner of Sydney Road and Thornton Street opened 17 August 1921 (2).
" As soon as we received the call," remarked Mr. Bear to a Herald reporter yesterday, " and had let Nos. 1, 2, and 3 stations know, we turned out with an engine and salvage van. We galloped along towards Balmain but as soon as we got on the other side of the Pyrmont Bridge we found out that the fire was in Johnstone's Bay, and, although it was a long way from Balmain, we thought it was over at the wharfs there. The next move was made towards the Sugar Company's wharf. When we got there I saw the watchman, and I told him to send a message to the Captain Cook. It seemed to me then that the three ships were getting alight. At last we got a boat, and succeeded in getting a couple of men on board. After I had been on board I thought that the best way to set to work was to tackle it from the shore, and we run off a thousand feet of hose with some small boats that were lent us. We soon had the hose at work but we first extinguished the fire on the Emu. Then we sent ashore for some hose and a branch from our steamer to work the tugboat Reliance, because she had no nozzle, and we had to put on our own hose. When we got the fire well in hand the Captain Cook came up. As soon as the Emu was finished with we were enabled to concentrate our strength on the Victorian. It appeared to me that the fire broke out in the saloon of the Victorian and worked its way forward and aft. Well, I suppose that from the time we started up to half-past 7, it took us that long to put the fires out. What we were afraid of was the steamers passing over our hose across the harbour. Two or three did pass over, and they took no notice of our signs to them. If they had picked up our hose we would have been in a nice predicament. I was waiting for the Captain Cook to come up when we first got there, and I did so as long as possible ; but if she had been there in the first instance we would not have run the hose from the shore. We tried ourselves, when we first got on board, before I gave tho order to slack the chain, to get the other two vessels away from the Victorian, because she was so much alight on the star-board side that there was then imminent danger of setting the others alight. Indeed, the fire had gone right through her portholes into the cabins of the Emu.
" It is quite true that Port Jackson is not included in the Metropolitan area specified by the Fire Brigades Act of 1884. Strictly speaking we have no right to attend a fire there, and in this very instance I have disobeyed tho instructions of my board, which wore that I was to have the money down before I attempted to put out any fire there. I am busily engaged us you see in explaining why I disobeyed that instruction yesterday morning. I have no jurisdiction in the harbour. I could not stop the steamers this morning from crossing my lines of hose, and had one of the screws caught hold of one of the lines it would have ruined it, besides endangering the lives of some of the firemen attending the hose. Again, if one of the vessels on fire this morning by some chance had broken away I bad not the appliances to deal effectively with it. You are referring to a float ? The time has come most certainly when a powerful floating fire-engine should be attached to the brigade. In fact, when the fire station at Circular Quay was built it was with the intention of manning a float from it. Now that the new wharfs are being constructed it would be a very opportune time to arrange the position of the float. It should be always under steam. This could be done by having two boilers, in one of which the steam could be up, and a fire laid in the other which would be connected with a beater, so that in ease of fire it could lit and steam got up in a very short 'time. The float would be available for use along the wharfs as well as out in the harbour. In fact there are many parts of the harbour which it is impossible to reach at the present moment with fire appliances of any kind at hand. A float would be able to reach these places. If a vessel were to take fire in any of them, we as a brigade would be perfectly helpless. I consider that a float attached to the Northern Fire Station would not cost more than £1000 per year for maintenance. This is the second largest harbour in the. world, and it is rather strange that we are without proper fire-extinguishing appliances. Through the port not being included in the Act of 1881 there are no funds available for the purchase of a float. I think it would be only a fair thing for the Government to find the money, and the underwriters and the shipping firms to allow a certain amount yearly to the Fire Brigade Board. The float would not only be useful for putting out fires, but it would be valuable to the underwriters for pumping out vessels at anytime. Do you mean that our shipping is unprotected from fire ? The Captain Cook W.D. Bear refers to here is the second pilot vessel of this name on Sydney Harbour, Captain Cook II. This vessel had none of the sepcialised water pumps needed for fighting fires and was frequently called to attend emergencies up and down the coast. She was stationed at Watson's Bay. The second of three Captain Cooks to serve as pilot vessels, she weighed 396 gross register tons and 172 net. She was built by Morts Dock & Engineering Co. of Balmain, Sydney, Australia,in 1893 and had a length of 155.8 feet, a width of 25.2 feet, and a depth of 13 feet, had 1 deck, and 3 cylinder engines which could attain 85hp. Registered in the port of Sydney, she belonged to the N.S.W. Government as part of its Maritime Services Board. THE FIRE PROTECTION OF SYDNEY HARBOUR. "Oh, yes; two-thirds of what we used was salt water. We had the Pluvius, the Harbour Trust boat, going up till 6 o'clock." "What would have been the result, then, had you had to depend upon the main?" FIRE ON A STEAMER. COPRA CARGO CAUGHT. VESSEL FLOODED. A fire occurred at Woolloomooloo Bay on Saturday morning, when part of the cargo of the steamer Varzin was burnt, and the hold had to be flooded to save the balance. What threatened to be a serious fire was only kept in limits, and ultimately subdued, by the combined and energetic efforts of the Metropolitan Fire Brigade, the Harbour Trust firemen, detachments of blue jackets from Garden Island, and the crew of the steamer. The outbreak is supposed to have resulted from spontaneous combustion in a shipment of copra. The firemen were speedily reinforced by the Harbour Trust Brigade, under Captain Pritchard, and a detachment of blue jackets from Garden Island, under Lieutenant Jefferson. The Harbour Trust men came on the scene in the fire-float Powerful, and in a few minutes four lines of hose from the steamer's strong pumps were added to the battery pouring water into the hatchway. The navy also contributed their quota. The handymen brought with them their Merryweatherland engine from Garden Island. They had it lashed on to a water tender, which was moored alongside the Varzin. Two lines of hose were worked by the blue Jackets, who also assisted the firemen on the ship by directing the branches down the hold, a very disagreeable job, on account of the pungent smoke which issued in dense masses from the burning copra. The Boray, 1951. Image No. : 10057h, courtesy State Library of NSW. Launching of the Bennelong: Goat Island, 26.11.51, Government Printing Office 1 - 10055, courtesy State Library of NSW. The 75-ton trawler Trusan burning fiercely at its moorings near Pittwater last night. The only person aboard, Mrs. Alice Stevenson, was rescued by dinghy. Firemen stood helpless as the ship burnt out. "I rushed down to the water's edge and found that my wife had been rescued. My wife escaped the blaze by clambering over the side on to a makeshift raft. She remained there screaming for help until a man on shore saw her. He took a dinghy out and brought her to safety. My wife told me that she was carrying a lighted oil lamp down the aft companionway to the crew's quarters when she tripped and fell. The lantern smashed against the deck, which had been newly painted. Before my wife could do anything the paint caught alight and the fire became out of control." Scotland Island Rural Fire Brigade was formed in the Easter holidays of 1955 when a small number of residents met at ‘Bangalla’ and formed a progress association. Their first priority was to establish the Scotland Island Volunteer Bush Fire Brigade to organise the individual efforts of the Island and the Western Foreshores. A shed was constructed by the residents near Tennis Wharf and the first fire vehicle, a jeep with a 44 gallon drum on it, was donated. Over the years, the equipment of the Brigade has improved and a new Fire Station was constructed in 1991 on the current site above Catherine Park. Since 1955, the Brigade has attended numerous house fires on the Island and several small wildfires. The first Scotland Island Fire boat dates back to the early 1970s. This was an old donated tinny with an old 15hp engine and a portable fire pump bolted to the floor. I don't believe that this fire boat was ever called out to a fire. Corrosion made this design quite impractical. In the late 1990s two fire boats were ordered for the Scotland Island and West Pittwater Rural Fire Brigades. These were both 6 metre flat bottomed barges with 30hp motors and marinised fire pumps. These boats were fitted with proper fire fighting equipment and radios. However, their limitations with dealing with boat fires and not being suitable for work outside Pittwater led to the Rural Fire Service commissioning two purpose built Rural Fire Boats in 2000. The new fire boats were 7 metre catamarans with twin 170hp Johnson outboards and large marinised diesel firefighting pumps. One of these boats was allocated to Scotland Island Brigade and the other was allocated to the Headquarters Brigade in Terrey Hills (on a trailer). The size and speed of these new boats meant that they could carry much more equipment and could be used for boat fires. The large pumps made them very useful for fires in Broken Bay and up the Hawkesbury. After 10 years of service the last cat was retired. The design has proved to be a big improvement but the running costs, limited range and poor reliability had proved problematic. A new 7.8 metre stabicraft with a single 200hp outboard and a smaller lighter pump was built for the Scotland Island Rural Fire Brigade in 2006 This appliance is designed as a quick response boat. It is intended to get to boat, marina, water access bush and structure fires quickly. 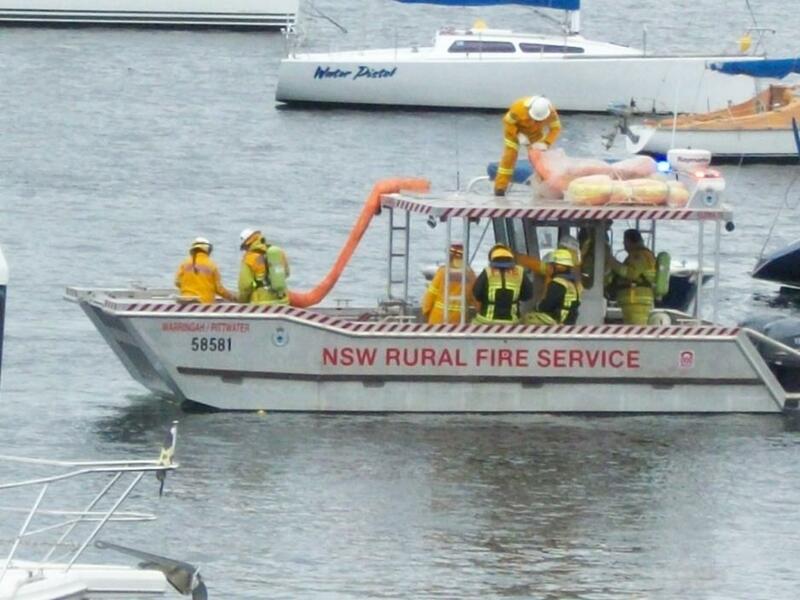 In 2011 an new purpose built fire barge was built for the West Pittwater Brigade. This barge is more than 8 meters long and is designed to transport crews and equipment and also to be a shallow draft high volume pumping platform. Today the two Pittwater Fire boats one located on Scotland Island and the other in Elvina Bay are manned by volunteers. These boats are jointly called out for boat fires, marina fires, waterfront access bush and structure fires in Pittwater and Broken Bay. Over the last 20 years Rural Fire Service volunteers have attended many boat fires and have Saved and protected hundreds of thousands of dollars with of property. Top Photo: The old fire boat which was used by the Warringah Pittwater Rural Fire Service.It was a catamaran hulled boat with 2x225hp counter rotating outboard motors. There is a pump on the back work area, stainless steel to reduce corrosion from pumping salt water, the same design and water output as the RFS fire engines. The red thing on the roof is a monitor. Plumbing can be seen running the length of the boat on this side along the gunwhale. Surveyed to carry a crew of 6. Photo courtesy of Martyn Schafer. Above Photo: NSW Rural Fire service boat at the Royal Motor Yacht Club - Broken Bay's Multi-agency Emergency Training Drill of March, 2012. Photo by A J Guesdon. The incidents of on board fires and bushfires in Pittwater ranges from before records were made and accounts of these events fill papers since. One of the most recent and memorable of these is the July 22nd 2009 blaze at Newport Anchorage Marina. Photo to right by Damian Devine. What I remember of the 2009 event was the sheer volume of thick, black, dense smoke – it was incredible and the noise it made, it was scary. I thought, at the time, it must have be catastrophic to people and property. The actions of everybody to get in and support the emergency services was amazing and symbolised the Aussie spirit. Towlers Bay Fire (Pittwater LGA) 18/01/13 20:49 Posted: A fire is burning in the Ku-ring-gai National Park in the Pittwater area. Current Information Firefighters are working to contain the fire which is burning on West Head within the Ku-ring-gai National Park. Remote properties, accessible only by water, in areas including Lovett, Morning and Elvina Bays may experience smoke and embers. Crews are in place to protect properties in these areas. Full marks to those men and women volunteers fighting fires in this heat. We spoke to Captain Kylie Stackhouse of the West Pittwater Rural Fire Brigade who recalled the fire-boat was used to fight this blaze; 'How much water have you got?' came the call from the top of the hill; Kylie, pump into the salt waters, said back 'How much do you want?' proving that accessing all that salt water to fight fires, over a hundred years on, is still an obvious asset. Left: Elvina, the early days, courtesy West Pittwater Rural Fire Service website. The West Pittwater Rural Fire Service, servicing the southern Western Forsehores of Pittwater, including the offshore communities of McCarrs Creek, Elvina Bay, Lovett Bay and Morning (Towlers) Bay has Stations in Elvina (South) and Lovett (North). They have two Category 7 tankers; Elvina 7 and Lovett 7, one Personnel Carrier Elvina PC and the South Pittwater, second response fireboat, West Pittwater 15. The unofficial name of this vessel is 'the Bob Anderson' after a former Captain aof this brigade and long term resident. Officially she is The Elvina Boat. Our Rural Fire Brigades, staffed by volunteers, are part of the largest volunteer fire fighting brigade worldwide, with over 70 000 members. They are the difference between life and death for many in Australia and have their counterparts, under other names, in every state of Australia. Here in Pittwater they are always those folk who get on quietly with the job required as well as their day jobs. Their attitude is 'look at this!' referring to the devastation wrought by fires and people unprepared for them rather then a 'look at me' attitude. More hands are always needed for such work in a wide range of roles. Details on the NSW Rural Fire Service website HERE. SIRFB History by Ian White. Extra threads collected by A J Guesdon, 2013.